Reflections from Teaching in India & WriteSteps Named SIIA Education CODiE Award Finalist! WriteSteps Teacher Earns Michigan Technology Using Prek-12 Teacher of the Year Award! For three weeks while visiting classrooms in their second year of using WriteSteps, I volunteered working with both the children and the teachers at the Isha School in India. It brought me back to not only my years of being a teacher, but also my years spent coaching teachers for their professional development. While in classrooms, I witnessed teachers having a deep sense of the importance of the work they’re doing and understanding their responsibility towards blossoming young minds. The Isha teachers have tremendous dedication and a willingness to grow and constantly improve their craft. These positive characteristics aren’t exclusive to just the teachers at Isha. I’ve witnessed them not only in myself, when I was a teacher, but in the countless educators I worked with in schools across the United States. However, there is a stark difference that I noticed this trip: these teachers very rarely praise their children. Now, you might assume this is a detriment to the child’s self-esteem, but I’m not so sure. In the United States, we praise children continually, “You did a good job on your writing.” and “I like your writing.” We believe that we are helping boost the children’s self-esteem. But here at the Isha School, the children have plenty of confidence and self-esteem without teachers continuously praising them. So what gives? Well, one of the major differences, it seems, is that the children work for themselves. During their WriteSteps classes, I observed children who were really excited about their writing, not because of what their teacher was going to say or think, but because they saw their own growth and wanted to do better for themselves. In the U.S., we teach children to want and look for praise from outside sources confirming whether they are “good,” or “bad,” at writing. I shudder at all of the times I’ve heard children and adults tell me they’re not good writers. When asked why they think this, they usually cite a teacher along the way telling them so. Therefore, we’ve manufactured the concept of needing to boost self-esteem through empty, general praise. Teachers unknowingly contribute to the lowering or rising of this so-called self-esteem boosting, by over praising in general sound bites. We are creating praise addicted children, ones who base their value on what others think. So, where does this leave us? To praise, or not to praise? It’s not that black and white. Instead, it is how you praise that makes all the difference. I taught the Isha teachers that frequent, empty praise versus specific giving of glows are completely different. It’s in our DNA to want to hear glows, areas of strength, before we hear grows, areas for improvement. It’s the good news before the giving of bad news. The Isha teachers learned to start the conference telling the child one or two specific glows. I leave you with one last thought. Next time your students ask if you like their writing, ask them what they think of it. Provide them with one or two specific glows and grows about their piece. This way there is learning involved and not just empty praise. Let’s not create a world of praise addicted children, but a world in which children work hard to please themselves. 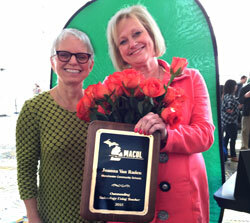 Joanna Van Raden Receives the Award for Michigan Technology-Using Teacher of the Year! Five years ago, Joanna Van Raden abandoned the “sage on the stage” teaching model and embraced the “guide on the side” coaching method. 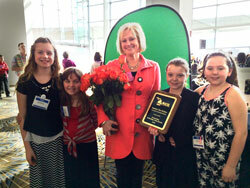 Joanna Van Raden pictured with some of her students during her awards ceremony at Cobo Center in Detroit. Joanna, a WriteSteps teacher from Manchester Community Schools in Michigan, used her technological knowhow and progressive mindset to “blend” her classroom with technology. And, in doing so, garnered an award from the Michigan Association for Computer Users in Learning. Van Raden was named the 2015 Outstanding Technology-Using Pre K-12 Classroom Teacher. Van Raden has been teaching in Manchester for over 31 years at Luther C. Klager Elementary School. She has seen many changes over the years and technology has altered the look, feel, and dynamics of the classroom. Joanna has developed her own unique way of teaching WriteSteps. She recorded the 3rd and 4th grade writing and grammar lessons so her students can watch her teach them anytime, anywhere. Instead of using a lecture format, Joanna provides direct instruction in other ways. Working at their own pace, her students stay on the same unit, but may be on different days. 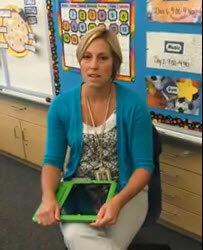 Her blended classroom method allows her to differentiate instruction and conference all day with her students. Joanna Van Raden pictured with Arlynn King, WriteSteps’ Coaching Director. Due to her students’ success, WriteSteps has partnered with Joanna to create video lessons for other WriteSteps’ teachers who want to use Joanna’s blended classroom method. This innovative format is one of the reasons Klager Principal Jennifer Mayes nominated Van Raden for the MACUL Award. Van Raden says receiving the award from MACUL, following in the footsteps of outstanding Michigan educators who have inspired her, is a high honor. Excerpts of this article have been taken from a press release written by Washtenaw Immediate School District. We are thrilled to announce that eWriteSteps was named a finalist for the 2015 SIIA Education CODiE Award for Best Reading/English/Language Arts Instructional Solution. The SIIA CODiE Awards are the premier award for the software and information industries and have been recognizing product excellence for 29 years. This year’s program features 28 Education categories, several of which are new or updated to reflect the latest industry trends and business models. – Edgenuity English Language Arts, Edgenuity Inc. Winners will be announced during a special awards dinner at the nation’s leading education technology conference, the Education Industry Summit, in San Francisco on May 5. The announcement will also be live streamed. Alyssa Crum, a second grade teacher at Pine Street Elementary, shares a tip for incorporating technology into the editing process using Dragon Dictation. Email [email protected] to learn how you can submit your own TeacherFeature tip and earn $25. Watch as Janice Kato, a fifth grade teacher, demonstrates to our WriteSteps team how she is able to use Google Classroom to vary the conferencing experience by occasionally conducting virtual writing conferences with her class. This gives students the opportunity to interact and collaborate with others using technology. Google Docs and Google Classroom are examples of free programs available for use by educators. Email [email protected] to find out how you can become a TeacherStar and earn $200.